Do you want to learn which Google Analytics metrics are the most important for growing your business? When you know which metrics are actually useful, and how to track them, you’ll be able to focus your attention on exactly what matters and grow your business faster. Plus, you’ll be able to save a lot of time and effort. 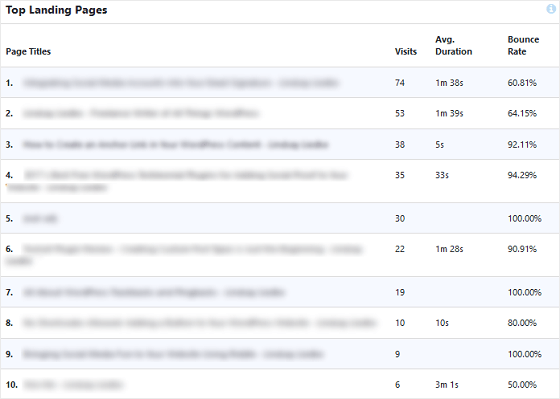 That’s why we’re going to share the 7 most important Google Analytics metrics every business should track. First, you’ll want to track user demographics and interests because these metrics allow you to learn a lot about your visitors, and help you to plan well-informed business strategies. When you know which countries your visitors are from, what they’re most interested in, their age, gender, etc., you can make informed decisions about types of content, products, and offers to publish on your site. By offering what your users actually find useful, you’ll be able to solve their problems and convert them into customers. In addition, this also helps you to build trust and goodwill for your business. To track these metrics, you’ll need to create a Google Analytics account and connect it with your website. 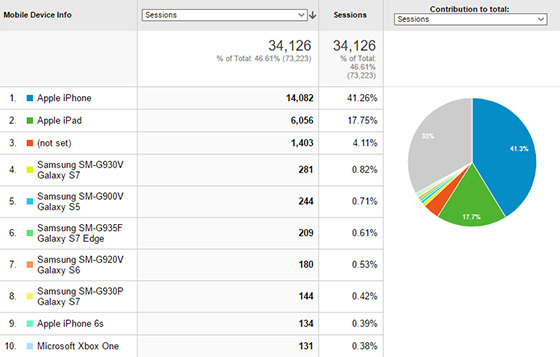 However, using Google Analytics has a massive learning curve for non-tech-savvy people. To make it a bit more understandable we suggest using MonsterInsights for tracking user demographics and interests as well other advanced site metrics. It’s a very user-friendly Google Analytics plugin for WordPress. After you set up MonsterInsights on your WordPress website, you can go to Insights » Reports » Publishers to view your demographic and interests reports. By tracking the most popular content on your website, you’ll understand what type of content is really working on your site and what’s not. When you know which blog posts and pages are getting the most traffic, you can analyze them, and build a better content strategy for your business. In other words: you can keep giving your visitors more of what they like the most! Moreover, you can optimize your most popular pages with lead generation hacks and boost your page conversions. MonsterInsights makes it really simple. You just need to visit Insights » Reports in your WordPress dashboard to view your top posts and pages. You can simply view your most visited posts and pages along with the actual number of visits here but MonsterInsights Pro has a lot more to offer. By using the MonsterInsights Pro, you’ll get a more insightful report of the popular content on your site under Publishers Report. To view this report, you’ll need to visit Insights » Reports » Publishers in your WordPress admin area. In this report, you’ll be able to see your top landing pages along with the number of visits, average duration, and bounce rate. That’s not all. There’s more in the Publishers Report. 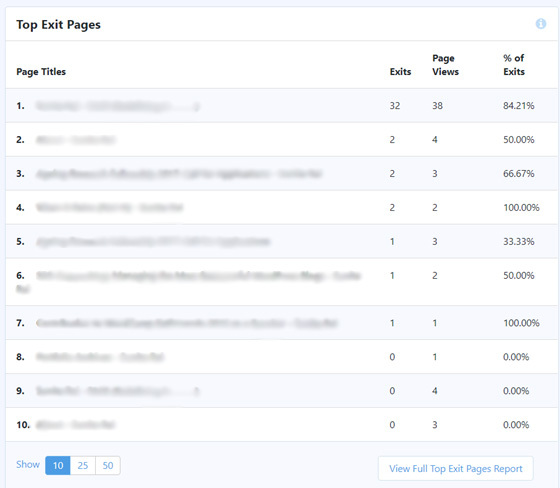 MonsterInsights Pro also shows you the top exit pages on your site (i.e. the lowest engaging pages on your site). You can find this report just below your Top Landing Pages report. After analyzing this report, you can improve these low-performing pages to boost your user-engagement and site conversions. Forms are one of the most important points of user interaction on your site. As a user fills out a form on your site, they’re taking the next step in their customer journey. In addition to collecting leads, you can use forms for collecting feedback and comments from your users. Forms are a major indicator of user engagement and are massively important for the overall success of your business. Thus, forms tracking is an important metric you’ll need in order to achieve your business goals. With MonsterInsights, you can easily track all types of forms on your website. It has a powerful forms addon for tracking your online forms. To enable forms tracking, all you need to do is to visit Insights » Addons and install and activate the Forms addon. Once the addon is activated, it will automatically start tracking your WordPress forms and then offer you easy to understand reports. MonsterInsights’ Forms addon supports all the major contact form plugins including WPForms and Ninja Forms. You can also set up forms tracking in Google Analytics manually; however, it has quite a few steps which are largely technical. If you’re not an expert, it’ll be a difficult task. Therefore, you can use MonsterInsights Forms addon for tracking all your forms and growing your business faster. Google AMP is highly recommended for all websites as it enhances the experience of your mobile users. Google’s Accelerated Mobile Project (AMP) is an open source initiative with the goal of making the web content load faster for mobile users. By enabling Google AMP on your WordPress site, you can see an increase in happy faces, better engagement, and more conversions. In addition, it reduces page abandonment. Once you set up Google AMP on your WordPress site, you’ll need to monitor it to check if it’s really working. 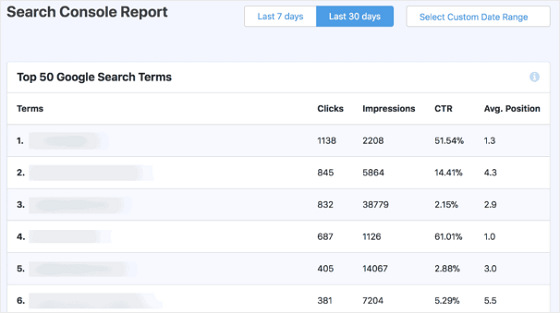 By tracking your AMP reports, you’ll be able to view the actual reports of your mobile traffic. Therefore, you can make improvements to your site and engage more mobile users. MonsterInsights has an exclusive Google AMP addon to help you get the actual mobile traffic report. It makes it easy to track your mobile users with accuracy. Google Search Console is a website analytics tool offered by Google that helps you monitor your site’s presence on Google. By connecting your site with Google Search Console, you can get an idea of how Google indexes and shows your site in Google search results, find out which search terms drive you the most traffic, and a lot more. Given that Search Engine Optimization (SEO) is a very important element for growing your business, connecting Google Search Console and tracking the Search Console reports is crucial. 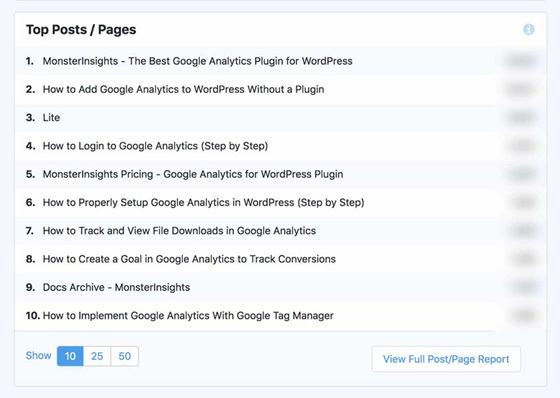 Using MonsterInsights, you can view your top 50 Google search terms within your WordPress admin area. To view this report, you’ll need to visit Insights » Reports and then click the Search Console link. With the help of this report, you’ll be able to understand whether your SEO efforts are working or not. Plus, you’ll get new blog post ideas by analyzing the keywords your site is already ranking for. You can read our step-by-step guide on how to configure your WordPress site with Google Search Console. Google Analytics lets you track your own custom dimensions metrics and get more insights for growing your business. 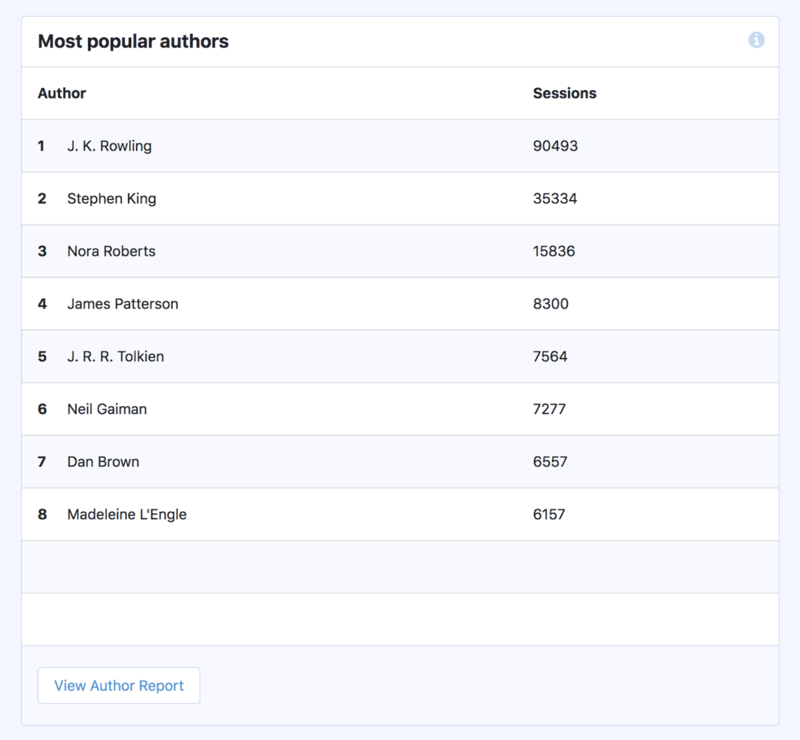 By tracking custom dimensions like the most popular authors, most popular post types, categories, etc. you’ll be able to learn what’s working on your site and what’s not. Then, you’ll be able to decide which things you need to focus on and which things need improvements. So, how do you track custom dimensions in Google Analytics? Here is our complete guide on setting up custom dimensions in Google Analytics. With MonsterInsights’ Dimensions addon, you can easily track custom dimensions. If you’re selling things on your WordPress site, it’s very important to know your store metrics in order to sell more things. By tracking your eCommerce sales, conversion rate, transactions, and revenue, you can get a clear picture of how your store is doing. Using this data, you can optimize your eCommerce store and boost your sales and revenue. Tracking eCommerce data in Google Analytics is easy with MonsterInsights Pro. It has an eCommerce addon for automatic tracking of your WooCommerce and Easy Digital Downloads transactions. 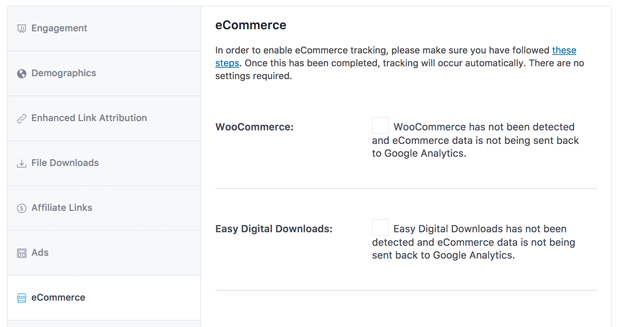 In order to set up eCommerce tracking, you need to install the eCommerce addon and activate it. Then, go to Insights » Settings and click on the eCommerce tab. There, you can simply check the box for the plugin you are using, either WooCommerce or Easy Digital Downloads. 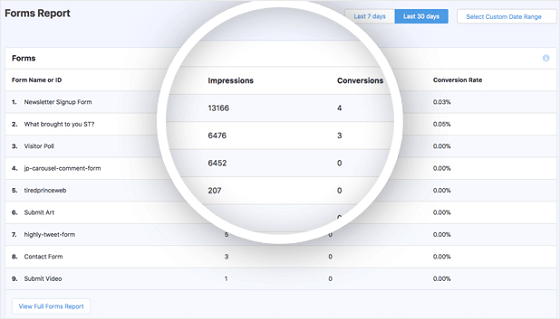 Now, to view the eCommerce reports, you’ll need to visit Insights » Reports. Then, click the eCommerce link. 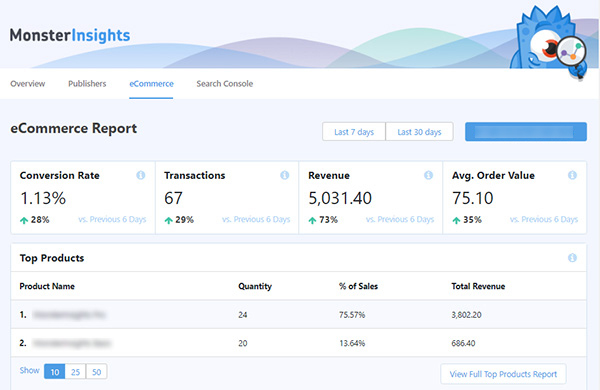 In the eCommerce report, you can see all of your critical eCommerce data including total transactions, revenue, conversion rate, top products, etc. Moreover, you can also set up ads tracking, file download tracking, affiliate tracking, etc. easily using MonsterInsights. Thus, MonsterInsights is your go-to tool for setting up Google Analytics and tracking all the important metrics for your business growth. We hope that this article helped you to learn about the most important metrics every business should track and how to track them easily.